2.25x12 Wicker Polished Brass Floor Register Discounts Apply ! Brass grilles and registers are a great design choice when updating your home. Your 2.25 x 12 floor vent covers have a strong steel core for added durability. 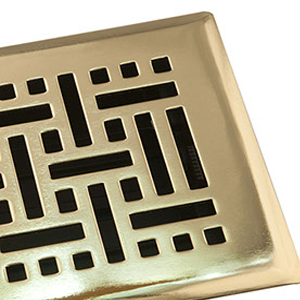 Brass grilles are easily matched to light switch plates and plug in cover plates for a uniform look. 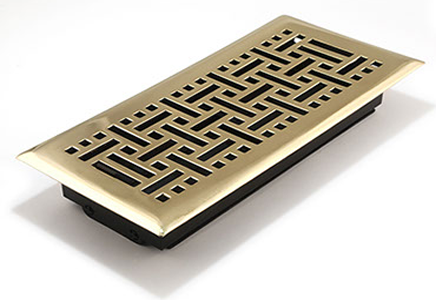 These floor vent covers have a durable topcoat to protect the polished brass finish. Brass grilles have a fully working plastic damper to regulate air flow for every room that you have one in. These beautiful floor vent covers have a wicker pattern for a great look. ***Hint: The industry standard is to order floor vent covers using the actual hole opening size and not the faceplate size. This wicker polished brass grille will fit a 2.25 x 12 inch hole opening. Brass Grille Faceplate Dimensions: 3 5/8 inches x 13 3/8 inches. Actual Damper Dimensions: 2 1/4 inches x 11 7/8 inches. Floor vent covers can be purchased in several sizes and 4 finishes. Polished brass grilles are a classic look in any style of home. Order your floor vent covers today!